For 30 years, Jerome Johnson maintained that he was innocent of the 1988 killing of a Baltimore man inside the Nite Owl bar. On Monday, a judge agreed. "Today marks the first time in 30 years that the criminal justice system has worked for Jerome," said Shawn Armbrust, executive director of the Mid-Atlantic Innocence Project. The nonprofit at The George Washington University helped set him free. Johnson served most recently in the state prison in Hagerstown, where he woke each morning at 5:30 to pray and work out. Once free Monday afternoon, he hugged his brother and shook hands with his three nephews. "He looks at it like it was part of his journey," said his brother, Shawn Morgan. "He's very spiritual." Taylor was killed 30 years ago this month. Witnesses told police Taylor had been arguing with several men on the street outside the Nite Owl on Woodland Avenue in Park Heights. Someone drew a gun and tried to shoot Taylor, witnesses said, but he ran inside. Prosecutors say a witness in 1997 placed Johnson some distance from the scene of the killing. The shooter admitted to the crime in 2000, prosecutors say, and said Johnson wasn't there. Johnson's case was taken up five years ago by Nancy Forster, the former public defender of Maryland. She investigated further and contacted Lipscomb's unit, which then recruited help from the Mid-Atlantic Innocence Project. The nonprofit, founded in 2000, works to correct and prevent the conviction of innocent people in Maryland, Virginia and the District of Columbia. 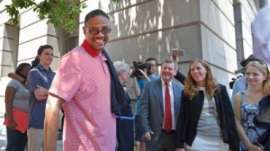 Officials say they have helped secure the release and exoneration of 28 innocent men who served a combined 494 years in prison for crimes they did not commit. On Monday, Lipscomb presented the new evidence to Judge Charles Peters and asked for a new trial. Then she dropped the charges against Johnson. Outside the courthouse, Baltimore State's Attorney Marilyn J. Mosby thanked Taylor's family for supporting the exoneration. "My heart breaks for the family of Aaron Taylor," Mosby said. "I thank them for their wisdom and their grace. Will he be receiving any compensation for a life lost??? Similar happened this week in South Australia, this man was actually my neighbour! "An Adelaide man who spent 20 years in prison only to have his murder conviction quashed in 2014 has welcomed the South Australian Government's decision to pay him $2.5 million in compensation." Thank you Phyllis. I cannot even Imagine how it must be to return to the world after 30 years confinement. I'm glad he has family and I'm sure he'll get that homecooked meal..
What a corrupt force that imprisoned that gentle man for a crime he didn't commit ! Where is his compensation for those lost years ???? Also what about the inefficient lawmen ?? They deserve punishment. Good to see this man go free, albeit 30 years too late. It's very unclear if Jerome Johnson will ever be compensated for the 30 important years of his life or not, but he certainly deserves it so he can chronicle his life as a free man in the notebook he's been given, inviting him to step into Nelson Mandela's footsteps. It is SO very sad someone suffers all that time for not their mistake but the courts. A shame 1/2 his life is gone but at least he has the rest of his life to look forward to. It's great he was exonerated! Thanks, Phyllis. Happy that he is free, but the nightmare he dealt with for 30 years - and now how difficult will it be for him to begin again his life as a free man? I hope he is compensated and doesn't have to find a job! The best part of his life is gone though, how can he come to terms with that? So glad he is free, Finally!!!!!!!!!!!!!!!! So glad he is free. I'm happy that is free, but I would like him to receive justice after all these years in prison. The best years of his life were hell, now he is free, hope he gets compensation to make up for all the wrong he suffered for 30 long years! Great comments and sorrow for all the lost years. Henriette so happy to see you peek in.